Unless your kitchen is very hot, it's not absolutely necessary to chill the dough, but it is helpful to let it rest for an hour or so to give the flour a chance to absorb the liquid. Press dough into a disk, wrap in plastic wrap, and chill for 30 minutes to 1 hour. Preheat oven to 375 degrees. Working with half at a time, roll dough out on lightly floured counter to 1/4 inch thickness and cut, then transfer cookies onto cookie sheets that have been lined with parchment paper or silicone liners. 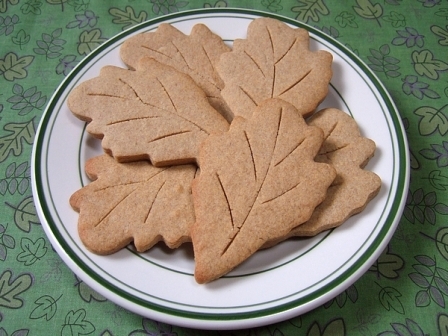 If you like, use a sharp paring knife to score a decorative design on the surface of the cookies. Bake 8 to 10 minutes, until lightly colored. Let cookies cool slightly on cookie sheets, then transfer to a wire rack to cool completely.